While this incredible Marine Research Center's may appear quite futuristic in form, the design was actually inspired by the structure of an ensuing tsnumai wave. Designed by Maine-based Solus4, this off-shore research center was an entry for a competition co-sponsored by Arquitectum and Universitas Pelita Harapan in Indonesia. Still feeling the aftereffects of the 2004 Indian Ocean tsunami which devastated countless communities, the competition was initiated to address the need for tsunami research and the development of effective disaster relief measures. Solus4's response is fluid building that not only provides space for study and research, but generates all of its own power and clean water. The concept for the 2,500 sq m offshore marine center is a colossal white structure located about 150 meters off the of shoreline of Kuta Beach in Bali. Large windows provide views of the surrounding ocean environment, while underwater viewing rooms offer visitors views of the aquatic life. The marine center provides space for research labs, living quarters for the scientists, a seawater pool, an aquatic garden library and an auditorium. Scientists working and living aboard the research center will be studying the tsunamis and disaster response. 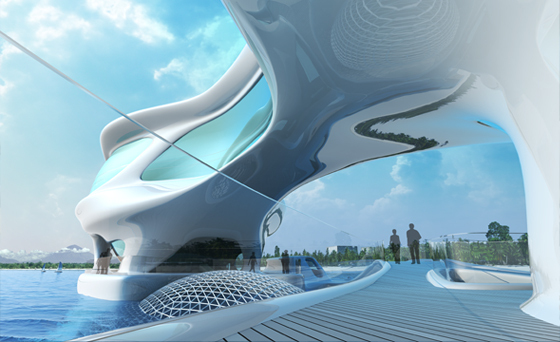 The design of the research center was inspired by the form a tsunami wave takes as it proliferates across the water. Apart from taking a cue from nature, the center will also be energy efficient and capable of producing its own power and clean water. Tidal generators will be used along with photovoltaics to generate electricity, while solar passive and energy efficient design will minimize energy usage. Rainwater will be collected and seawater conversion systems will provide potable water for the facility. Sea-sourced water will be used to provide radiant cooling to the skin of the building. wow it's very amazing. i am the student senior high school from Indonesia(Jakarta). i am very interesting with "Sustainable Marine Research Center Studies Tsunamis" is it able for me and the other people that want to know about science of marine, and about the design of the building, to visit? Respected sir, my name is ram kumar, i had a good project on the tsunami sir ,It is completely a civil constructional project sir,if we construct this project we can save millions of the peoples life .I am trying to release this project since last from 2 months.but i am unable to release the project. so please try to help me so, that we can save the the world sir, i will sent some of the information of the project.please sir i am requesting you to help me sir, sir i am not lying its true it took 4 years for me to go on with this project. i am sure that this project will be a good success. please help me sir, thanking you sir, yours faithfully , ram kumar, The entire project is designed by considering the natural look of the sea shore. The project will not cause any problem to the natural beauty of the islands, coastal areas etc... The project will be present under the sand layers of the sea shore. The project mainly consists of two parts they are: Ø Tsunami project part. Ø Commercial part and the project part. Tsunami project part: They are sub divided into many parts they were as follows: v The BASE section v SUPPORTING pillars 1 v PISTON section v PISTON’S v Main Piston pumping section v PISTON BASE PART v PISTON CONNECTING PIPES v Valves v Escalator 1 &2 v Lift section v Parking place v Layers v Layer connected to the base section Base section: The base part is the one of the important section contains the layers arranged in an order. The piston rod will pass through the base part and lifts the layers present on the top of the base. When the danger occurs the layers present on the top of the base will be lifted up from the ground as soon as the wave comes and hit the layers the base part present at the bottom will provide the good support to the layers to withstand to those waves. There is another section which will be providing the additional support. The supporting pillars will provide the good support and make the entire base section as constant one without any deviation in the strange conditions. The base section and the supporting pillars where connected to each other. The base section will be in the form of a block each and every block combines and form the single one. The front part of the base section will be thick while compared to the back part. The boundaries of the entire base part are made up of concrete and the internal part is completely filled up with the sand. The base part will have a small bend of 5 to 8 degrees so that they will give the support to the layer to oppose the waves. The first layer will also have the same bend of same angle so that both of them will get contact to each other tightly. There will be another small block of concrete inside the base section which will be giving the extra support for the layers. Because of this process the entire weight falls on the base part the base section is connected to the commercial section basement part so that it will be giving the extra support for the layers which were lifted from the ground to a certain height by doing this process each and every system will be connected to each other and increases the stability level of the system. Because of this process the damage ratio will also be reduced. My address: P.V.Ram Kumar, D/o: 49-46-3/4, Near jagga rao bridge, Akkayyapalem, Visakhapatnam pin: 530016, Andhra Pradesh, India. what is the structure of the building ? How is the construction of buildings on the water? 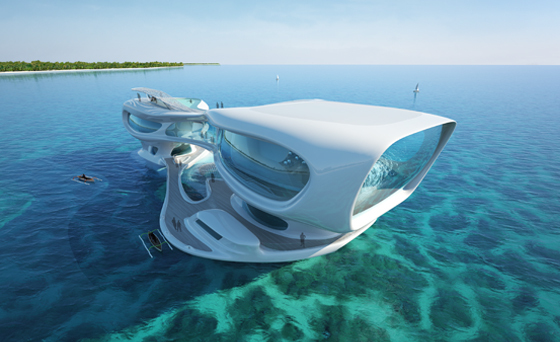 Is it just me or does this design look like the bad guy headquarters from the 007 movie "The Spy Who Loved Me"? They should make it so the only way to get to this is by Lotus submarines....that would be cool. Maine-based architectural firm Solus4 designed this concept for a competition sponsored by Arquitectum and Universitas Pelita Harapan in Indonesia. The research center is intended to provide a place for scientists to study tsunamis and develop disaster responses. The center would be located about 100 meters off the coast of Kuta beach in Bali and would serve as a visitor center and a tourist attraction. The 2,500 sq meter facility has space for labs, living quarters for scientists, an auditorium, a seawater pool and an aquatic garden library. The futuristic and fluid research center would feature sweeping views through large windows of the surrounding aquatic environment. Underwater viewing platforms would let visitors get an upclose look at the sea life to develop a better appreciation of the Bali coast. The facility would be completely net zero and produce its own power from tidal generators, located in the water nearby, and from photovoltaics embedded in the building and glass. Rainwater would be collected from the building and seawater conversion systems and be turned into potable water for domestic use. Climate control and cooling for the facility would be provided by an underwater heat pump able to bring up cool ocean water to cool the skin of the building. Solus4's form and structure is inspired by the tsunami wave.